These databases from DISCUS will be useful in your author study. URL for Citation and/or Research Log - select Permalink on the right side of the article. Copy the URL from the pop-up box to include in the bibliography. Do not use the URL in the top address box because it is a temporary link that will only work during this search session. Citation - Select Cite on the right side of the article. Select MLA from the Citation Format box that pops up. Copy and paste the citation into the bibliography. Format, size, and spacing may need to be changed after pasting. URL for Citation and/or Research Log - select RECORD URL at the bottom of the article. Copy the URL from this box to include in the bibliography. Do not use the URL in the top address box because it is a temporary link that will only work during this search session. Citation - Select the Citation icon on the top of the article. Select MLA from the Citation Information box that pops up. Copy and paste the citation into the bibliography. Format, size, and spacing may need to be changed after pasting. Novels for Students (R 809.3 NOV) is the best set of books to use for this assignment. Look in the back of the book at the index. There are 3 different indices. 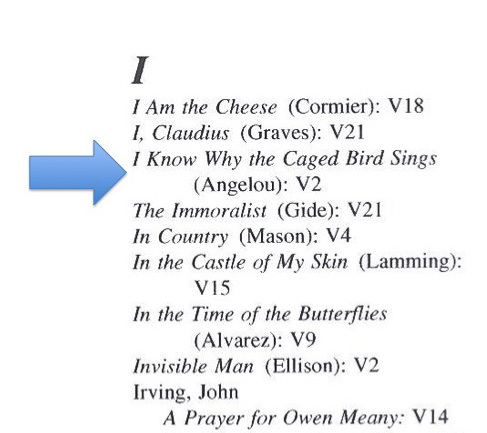 The index is searchable by author or title. 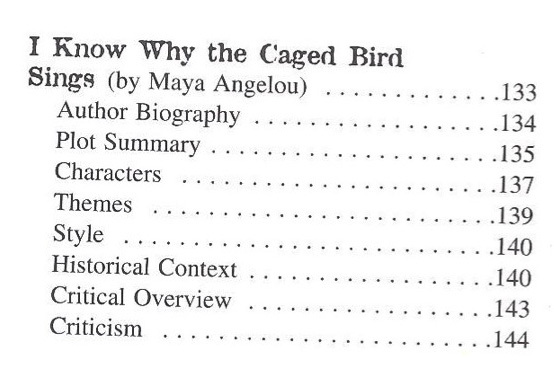 For example, I Know Why the Caged Bird Sings can be located by the author. (Maya Angelou) or the title. 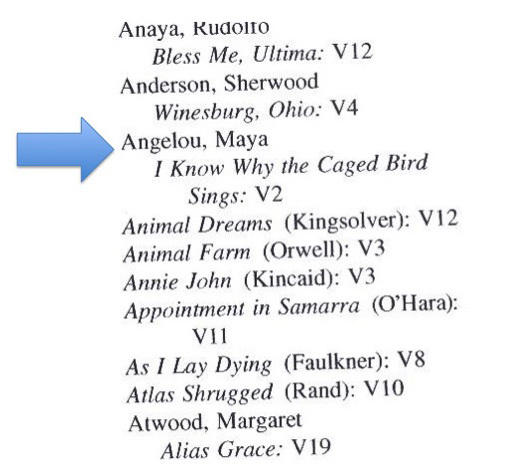 The volume number is indicated at the end of the entry, i.e., I Know Why the Caged Bird Sings is located in V2 (Volume 2). Look at the Table of Contents in the front of Volume 2. The titles are arranged alphabetically. The page number is shown for each part of this entry. Telgen, Diane, editor. Novels for Students. Vol. 2, Gale Research, 1997. 22 vols. These books also include information about authors. If you are having difficulty locating information in these series, please ask Ms. Boltjes, Mrs. Fear, or Mrs. Long for assistance.